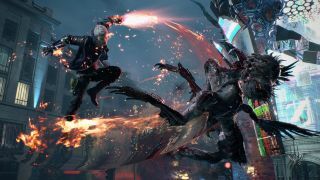 Devil May Cry 5, first announced at E3 in June, now has a release date which was revealed today at Gamescom. The "true sequel", as described by director Hideaki Itsuno and producer Matt Walker, will land on PC on March 8, 2019. Itsuno directed Devil May Cry 3 and 4, as well as Dragon's Dogma: Dark Arisen. We'll have more coverage of Devil May Cry 5 later this week from Gamescom.